Michael Gienger was born on 20 May 1964 in Nürtingen and grew up in South Germany beside the Schönbuch forest. Even as a child, he felt that his true home was in the woods and in the natural world. 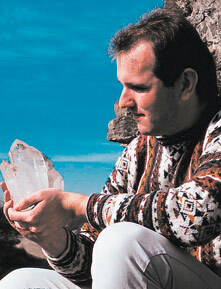 He inherited a love of the mountains from his parents and it was there that he also developed his passion for crystals. At the age of eight, he began to collect minerals systematically and at twelve attended his first geology lessons at community college. At about the same time, there was a growing movement among youth groups that united young people to work towards a meaningful life. At the age of fourteen, Michael Gienger began to lead school groups; at just sixteen he founded a magazine with friends that was devoted to topics such as natural healing, healthy nutrition, environmental protection, human rights, social responsibility, peace and freedom. At the age of twenty-one, after personal experience of the healing power of crystals, Michael Gienger developed an interest in healing crystal therapy and, having trained at an alternative therapy school in 1988, went on to make a significant contribution to its development. With a group of friends, he founded the first crystal healing research group in Stuttgart, followed by Steinheilkunde e.V., a crystal healing association (1995), the Cairn Elen Life Schools (1997), the Cairn Elen Crystal Healing Network (1998) and, finally, the Edition Cairn Elen imprint at Neue Erde (2000), through which both his own works and those of many colleagues have been published. Twenty of Michael Gienger’s books have been published, with editions available in a total of twelve languages. His magnum opus, the New Encyclopaedia of Healing Stones, was unfortunately destined to remain unfinished. Mindfulness and a sense of responsibility were the key motivating factors that led him to associate himself with fair trade in the mineral and gemstone business in 2005, and this involvement led him to participate in the Honduras Opal project in Lempira/Honduras from 2008. The non-profit Fair Trade Minerals & Gems e.V. association, on whose board he served, was founded on his initiative in 2009. In addition to his work on natural healing therapies and social responsibility, Michael Gienger was always concerned with promoting the understanding that only a change in our inner attitudes can make a healthy and holistic life of fulfilment and happiness possible for all. For him, a new lifestyle for the future was based on a mutual interplay of inner understanding and external involvement, to which he contributed with lectures, training courses, publications and useful products. Michael Gienger left behind his physical body on 16 November 2014 after a short but serious illness. He has gone, but his ideas remain.